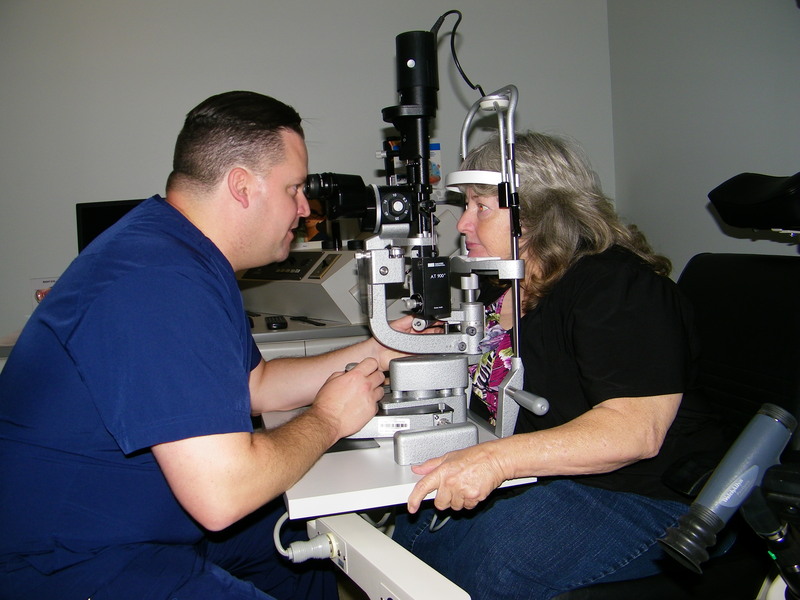 Dr. Chris Copp, director of Optometry, examines the eyes of a patient. The Optometry department offers comprehensive eye examination services for the following list of procedures and services: retinal examinations (including blepharitis, chalazion, diabetic, hordeolum management and treatment, hypertensive dilated and retinal dilated, pediatric, and routine); treatment (for glaucoma, ocular allergy, bacterial/fungal/viral infections, uveitis (inflammatory eye disease), dry eye syndrome); cataract evaluation; color vision testing, foreign body removal; geriatric eye care; intraocular pressure testing; lacrimal tear evaluation and lacrimal plug insertion; macular degeneration; ocular trauma; pupils and visual field evaluations; refractions (prism evaluation for palsies and contact lens evaluation); visual acuity testing among other procedures. Surgical excisions are to be added soon. Discounted glasses are available. Our optometry department provides high quality vision care services. The department personnel work together to assure accurate diagnoses and personalized treatment plans for every patient. Referrals are also made for other supporting health care services. For more information call (918) 587-2171.